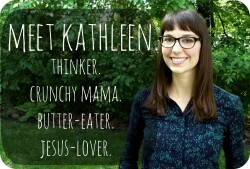 I like this post Kathleen. It is helpful to have the reason(s) articulated so well. I think what was most eye-opening for me is how much more other parts of the world spend on groceries. It is an encouragement to me (and my family) to continue to make the effort towards a more health and economically conscious grocery list. Its amazing how loud decisions like these can speak to others – we just had the opportunity to discuss some of our ethical choices with friends and family. It definitely sparked some interesting conversation. Thanks, Maria! It’s so true that our actions can often lead to interesting conversations without us having to try to push our values. I do seminars on grocery shopping, and how to pay as little as possible. So, when I read the title, I spilled my coffee and had to go change. Nevertheless, I think this blog is about the same things I preach: spend money on what MATTERS to you. We, as consumers , are so pumped full of propaganda as to what we need to buy to be happy, healthy and to make our marriage work. We are taught that we have no time, so we need to buy every time-consuming thing we can (and then work more hours to pay for it). Hats off to you, girl, for buying the things that matter to your family, and making what you can from scratch. As a funny tidbit, my four year old now makes fun of convenience foods with me at the store. “See, Mommy! Those yogurt tubes have just a little bit of yogurt, and that big tub has a lot! I wonder who’s going to buy them?” This will teach Lydia also, how to provide for her family the important things within her budget. Oh Sandra, you make me laugh! Sorry to make you lose your coffee!! As a Mennonite, I was trained from birth to always spend as little as possible, so it definitely goes against my upbringing and my instincts to spend more. 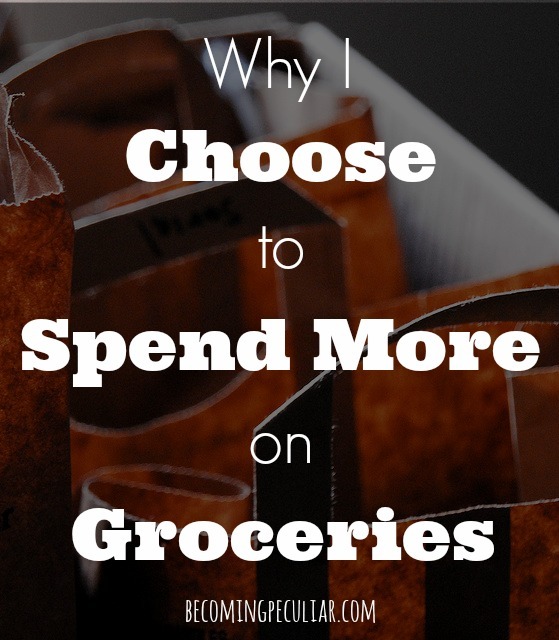 But I definitely see value the in saving as much as you can when it comes to groceries, too. Especially by avoiding convenience foods, as you point out. One could also argue that by saving money on things like groceries, you have more cash available to share with the less fortunate. Isn’t it incredible how our kids absorb our values like that? Way to go on teaching your children the problems with convenience foods! I’ve recently come to similar conclusions, and I love that you can state your reasons so clearly here. What really pushed me over the edge was watching those food documentaries where you see the horrendous conditions of the immigrants harvesting and processing our food here in America – it’s revolting. I never want to support that, however inadvertently. We’re not all the way, by any means, but we’re getting there. And I second the comments that you’re actually spending less money by not buying convenience foods! Love this! I am trying to get all this through to my husband! He was raised very differently (food and money-wise) than I was. He’s an accountant so I think I finally started getting to him when I told he could look at spending more money now as in investment in his health and he’d be saving money because we won’t be paying for medical bills down the road! His father developed diabetes a few years back and has since been on multiple medications for that, and now more pills after his quadruple-bypass heart surgery. If only he had taken the time and money to eat a healthy diet when he was young! There are days when I love your posts purely because they make me feel better about something I already think or do. This is one of those posts. :) I spend more than I have to on groceries too, buying organic, whole, local foods when possible. But, I always feel 25% guilty and 75% great about doing that, so it’s nice to have that 75% reinforced. My biggest source of guilt with spending that way is that so many can’t, and I value identifying with the poor, so it seems a little off to eat food many of my friends/neighbors/acquaintances can’t afford. Emily: I struggle with that, too. I feel a little snooty when I head straight for the organic section, turning my nose up at anything with soy or GMO’s. Even the fact that I can save money by cooking from scratch is evidence of my privileged position — I don’t have to work full-time at a minimum-wage job to survive. I think it’s healthy to stay aware of this tension. Thank you so much for this post! I found your blog through a Google search on cloth wipes (love that post as well!). You’ve put perfectly into words what I’ve had such a hard time explaining to others about my grocery purchasing decisions. Thank you for writing, I really appreciate your heart and lifestyle, and I look forward to reading more from you! Great post! I shared it on facebook because I like it so much. I feel very much the same way, although I am not religious. We vote with our dollars and when we buy things that weren’t produced in the “right” way we are saying YES to cruelty, to poison, to environmental degradation. No thank you! We forgo a lot of other luxuries in life (vacations, nice cars, data plans on our phones, etc) in order to eat in a way that supports our values. I love your ideas and so want to be in that place as well. 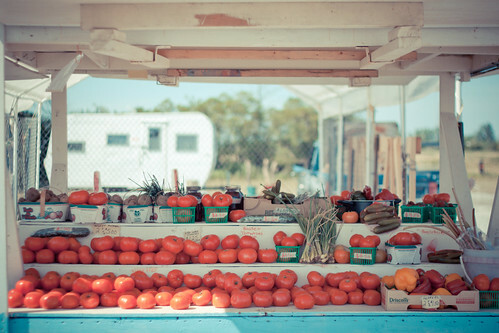 I want to buy local, organic, free range food too. But my family of 6 has an income of about $800 (USD) per month. We simply cannot afford to eat that way. Most months, we rely on food banks and gifts from friends and family just to have enough to eat. This post makes me feel nothing but shame and guilt that I’m perpetuating slavery, animal cruelty, and glorified thievery. But I have no other choice. Christy, I’m so sorry to hear you are struggling in this way. You aren’t the one who should feel guilty. Those of us who have good jobs at the moment should better contribute to services like food banks–both in cash and in good-quality, ethical food–so that people in need aren’t put in this situation. When we share with our friends and neighbors, we should share the best that we have. That is the nicest way I’ve ever seen this expressed, of course, because it reflects how I feel about it, too. Since I became disabled 15 years ago, I’ve been astounded how people felt entitled to comment, and very rudely, too, I might add, on everything I bought at the store. If I bought organic food, which I needed for my very debilitated health, I got remarks about how ‘I can’t afford organic’ and ‘welfare queen, and worse. If I splurged on Ice cream, that was fair game to vilify me for, too. Same with frozen food, fresh bread, meat, deli, you name it. There wasn’t anything I could buy unashamed when we actually got coupon books. Just because they can’t tell us from people paying with debit or credit cards now, I know the hate is still there. It’s so unnecessary, and hurtful to the hater as well as the hated. Great post! When people give me a hard time about our food budget, I make it clear that these priorities take sacrifice. For instance, we don’t get to eat chicken every night if we’re going to buy the chicken we feel is ethically better.